Organizations today are spending as much as 60 percent of their revenue acquiring the goods and services needed to support their business. Such large procurement budgets and a reliance on numerous suppliers and hundreds to thousands of products can make business goals increasingly complex. Ultimately, procurement executives may be charged with reducing the organization’s overall spend while simultaneously increasing the bottom line. To get there, purchasing professionals need a high-level strategic sourcing plan that lets them minimize supplier risk, create and maintain effective supplier relationships, monitor the quality of materials received from suppliers, and leverage supplier information to negotiate better contracts. Measuring and assessing supplier performance trends, then composing a true image of supplier relationships, is crucial to successful spend management. Manufacturers and distributors can realize significant savings by using the suppliers that serve them best. Yet keeping score on suppliers by analyzing and managing their performance is elusive unless analytics advance their capabilities past simple cost cutting to mastery of overall supplier performance analysis. Who in purchasing has not felt the pain of trying to weigh tradeoffs between product price and other critical supplier performance factors such as delivery or quality? Very often the purchasing pro’s job is to obtain the lowest possible prices for materials and parts. It’s how their performance is typically measured. But there’s a lot of grief to pay when a production line goes down because a supplier’s parts are either late or don’t make the quality cut. Which factors contribute to determining optimum supplier relationships? Which vendors have the highest / lowest returns and fill rates? Which suppliers deliver early / late / on time? Which suppliers have contributed to unneeded stock outs / inventory increases? Who is our top supplier in terms of contract value? What is our top category of spending? Is this category trending up or down? How often do our suppliers deliver goods at pre-negotiated rates? How accurate are the invoices we receive from them? An effective supplier performance measurement system leverages analytics to specifically answer these questions during the supplier evaluation process. Pro-active management, based on accurate, up-to-date information ensures that manufacturers and suppliers develop a collaborative relationship that drives greater efficiencies and competitiveness. Plus, supply risk is averted through the analysis of trends and automated alerts that provide warnings and enable corrective action to be taken before an incident and its associated cost implications occur. Special Note: In most firms, the supplier evaluation process is based only on supplier performance outcomes such as price, quality, and delivery. While these outcome measures are important in evaluating supplier performance, they represent part of the evaluation process. 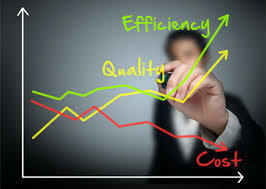 For example, a supplier may be achieving high levels of performance by utilizing enormous amounts of resources – making it an inefficient performer. And from a strategic perspective, businesses may be more inclined to develop long-term relationships with suppliers that are high performers and highly efficient. That’s because such suppliers are more likely to have the infrastructure and organizational capabilities in place to meet the changing demands of the buying firm in the long run. It’s the buying organization’s call, but a measure of efficiency may be warranted once cost, quality, and delivery performance metrics have been put into place. Are Retailer-Demanded Price Cuts Killing Your Bottom Line?